It has been four years now that my friend Cheryl was killed in a bizarre accident. Although we all know that life is finite I suddenly faced the loss of someone my own age. While mourning I spent time in my studio, a quiet place filled with light and color. The view out of my studio windows was into a wooded backyard. Only trees, no people. Serenity. Slowly, my work as well as my surrounding helped me in the process of healing. Not everyone is as fortunate as me having a calm environment. How do people cope when they live in big cities, take public transportation, walk on busy sidewalks? I started the series of “Wide Open Spaces” depicting abstract landscapes with the intention to give the viewer a visual place to rest and to relax. 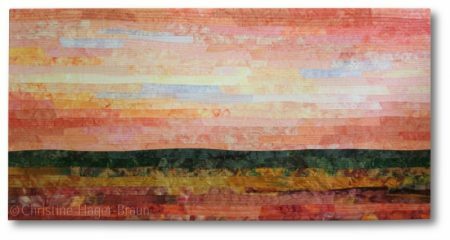 In the course of the past four years many of the art quilts from this series found forever homes with art collectors who say that my work gives them a sense of calmness. They meditate in the presence of my art quilts and find inner balance. It feels good to know that my work fulfills its purpose. Now I’m back in the studio, soaking up light and colors as I mourn the loss of my father. I’m convinced that creating art will help me in the process of my own healing. Once I will find my balance again I will be able to pass the positive energy on to others through my art work. Art is a powerful approach to healing. Find comfort in it!